While you cannot determine in advance the situations in which you might find yourself heading online to search for “locksmith Philadelphia services”, you do possess the ability to foresee this type of situation. Every day in this dynamic city, a certain percentage of residents discover they need locksmith assistance- urgently! Most licensed locksmiths welcome public inquries. Don’t hesistate to call one of these firms to request information about their hours, business locations, and fee schedules. For example, Star Locksmith Philadelphia will gladly inform potential customers about these issues before an emergency arises. We welcome the opportunity to communicate with you about our capabilities and policies, so you’ll feel completely comfortable calling upon us if an emergency ever arises. Visit our office at 1530 Point Breeze Avenue in Philadelphia to discuss our available services and fee schedules. We hope you’ll become satisfied long term customers! One excellent way to test the suitability of a locksmith firm involves requesting the company to provide non-emergency services. For example, you might consider asking a locksmith firm to cut a spare set of house keys for you, or to install a new security lock. Choose a locksmith near you who offers emergency assistance. 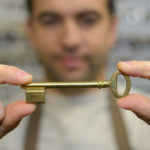 Taking this step will help you evaluate the dependabiity and work ethic of the locksmith. You’ll have an opportunity to see whether the firm meets your expectations, or not. Finally, we recommend employing multiple strategies for keeping the contact information for your preferred locksmith service readily available. For example, residents of Philadelphia sometimes experience auto, home, or office lockouts only to discover they left mobile technology in a temporarily inaccessible place! A cell phone recharging in a locked office or secured within a firmly shut vehicle won’t furnish much assistance in these situations. How can you ensure ready access to locksmith information? Some people simply memorize the emergency contact number for a preferred locksmith service. You might also entrust this information to a readily accessible neighbor or family member. If you encounter an accidental lockout, call this person. Ask them to send an emergency locksmith to your location immediately!